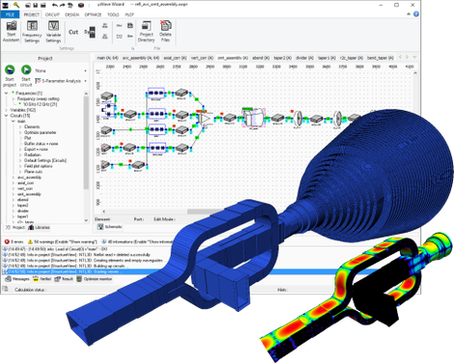 µWave Wizard™ is a full wave 3D electro-magnetic design automation suite combining the flexibility of the Finite-Element-Method (FEM) with the speed and accuracy of Mode-Matching (MM) for cost effective development of passive microwave systems and components, including antennas. The ability to parametrize component properties for control by different optimizers and the increased computational efficiency derived from solving individual circuit components before combining their respective solutions at circuit level are the benefits of this concept. Simulation time and development cost can be significantly reduced by composing RF microwave structures fast and easy using a combination of predefined parametric building elements and user generated elements instead of cumbersome drafting of complete 3D models of complex structures. The µWave Wizard™ can be optionally extended with a variety of useful add-ons.